Normal blood sugar level is between 3.8 and 7.5 millimoles per liter. The body maintains sugar in the form of glucose in the blood at all times, even during rest or sleep, and this is available to provide energy to the organs and cells. The level is usually described in millimoles per liter (mmol/L) or milligrams per deciliter (mg/dL). The conversion rate between the two is 18.02, simply multiply mmol/L by this factor to get mg/dL. Divide by this factor going the other way. So normal level is 3.8 to 7.5 mmol/L or 68 to 135 mg/dL. There is a regulatory mechanism in the body which controls the blood sugar level. If this mechanism does not work properly, or is overloaded, it can lead to problems. If it falls too low the person may faint or fall into a coma, if it gets too high it can cause damage to organs in the body, particularly the kidneys and eyes, as well as causing discomfort. 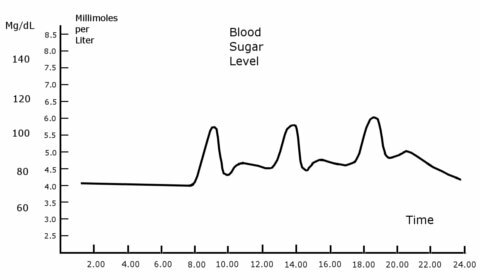 The above chart shows a fairly typical blood sugar level over a 24 hour period. It reaches it's lowest level just before breakfast and climbs to it's highest point shortly after the evening meal. As can be seen from the chart there are three spikes which correspond to the regular meals. It is beneficial to keep these spikes to a moderate level, they can put a strain on the body's regulatory mechanism, and over time lead to health problems. The ideal way to reduce the height of the blood sugar spikes is to eat less but more often, and to choose foods with a lower glycemic load. But the symptoms may not be obvious so it is worth having occasional tests as part of an overall health check up. Blood sugar levels falling below 3.8 mmol/L or 68 mg/dL can be considered hypoglycemia. It is probably quite common for non diabetic people to experience occasional episodes, perhaps due to fasting, or excessive consumption of sugar which causes a spike, then a dip in blood sugar level. 1. Fatigue, lack of energy. Severe low levels of hypoglycemia can cause fainting, coma or even death. There are meters available, however they mostly rely on a small sample of blood, hence the unpleasant necessity to use a pin prick. However, unless one is diabetic, there is no need to measure on an ongoing basis. A standard test is available which involves fasting and consuming a given amount of glucose. Even a regular blood test, without glucose, will give a good indication of the presence of hyperglycemia or hypoglycemia.